A few easy adjustments to your eating habits can give a significant boost to your wellbeing. It’s a consistent finding in scientific research that those who eat breakfast have fewer problems with cravings during the day, have better concentration throughout the day and can maintain a healthy weight. If you can’t eat early in the morning, take breakfast to work and eat before 10 am. Whenever you eat carbohydrates, but especially in the morning on an empty stomach, you’ll have a sugar rush with a concomitant and spectacular drop in blood sugar levels within two hours after your meal. This will make you feel lousy, sleepy and hungry again. Instead, load your breakfast with protein and fibre. This will not only prevent the sugar rush, but will also make you feel satisfied for longer. It takes a while before your brain realises there’s food in your stomach and you’re no longer hungry, so wait a few minutes before dishing that second helping. It’s not as if your food is metabolised differently in the evening, but more that we tend to eat larger portions in the evening. 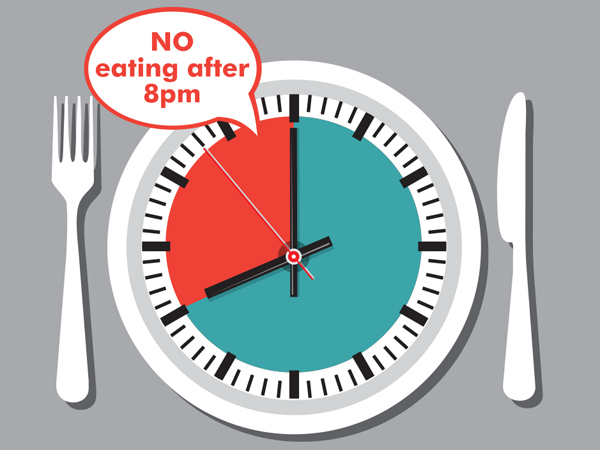 Studies have shown that eating late in the day may be less satisfying than eating the same amount of food earlier in the day. Also, in the evening our food and snacks are likely to be high in fat and calories. Ever wondered why the French look so good? Despite their healthy consumption of bread, cheese and wine, they rate as one of the few countries where less than 10 per cent of the population is obese. How do they do it? In France, every meal is an occasion, where people sit down at lovely laid tables with friends or family and they share a leisurely meal. Not possible in your daily routine? At least have the rule that you don’t eat if you’re not seated at a table. So no eating in the car, while standing in the kitchen, or behind your desk at the office. Take a break, breathe and think about the meal you’re having. Professor Elmarie Terblanche is the chairperson of the department of sport science at the University of Stellenbosch. She has an interest in research of a practical nature and addresses questions that are of relevance to athletes at all levels. Elmarie publishes in national and international accredited scientific journals and she currently holds a C3 rating from the National Research Foundation.